This post was sponsored by Plaid. I thank them for supporting Kleinworth & Co. because it helps me to continue to bring to you amazing and inspiring content! 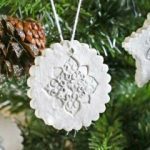 These Stamped Clay Ornaments are easy to make starting with this 3-ingredient homemade clay recipe. 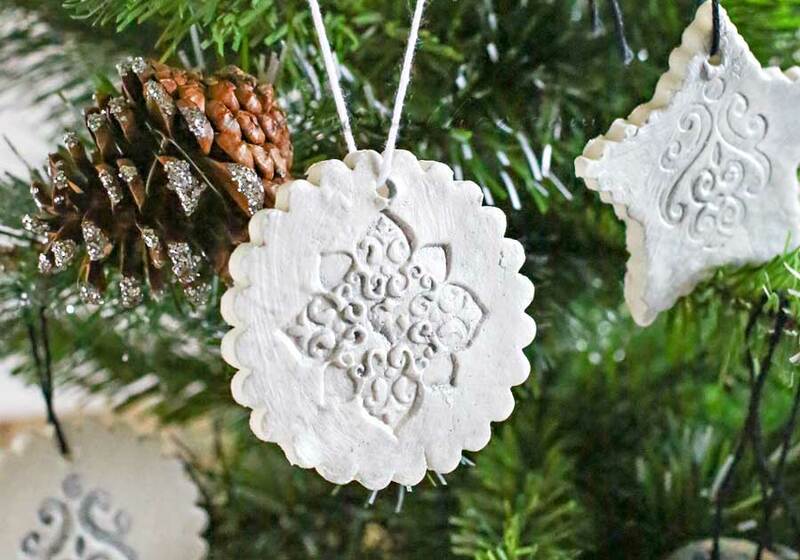 Stamp, paint & Mod Podge & you have beautiful tree decor. 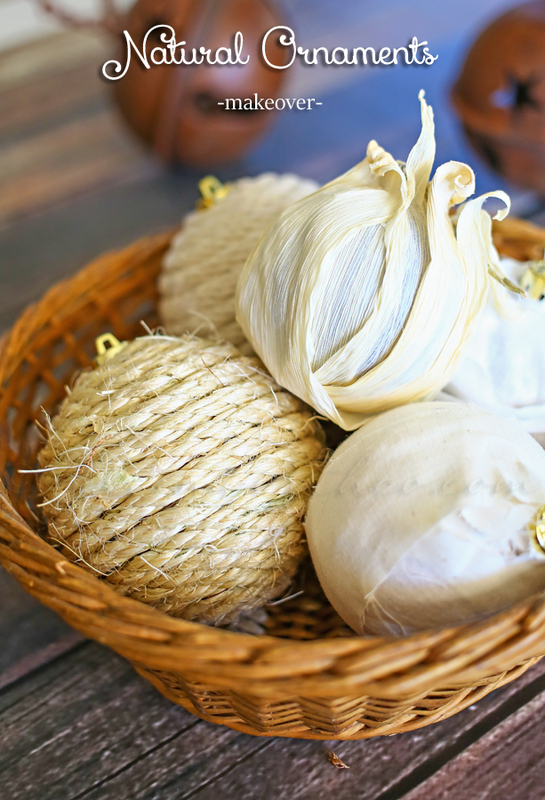 I love making homemade ornaments for the tree each year. I have this habit of wanting to completely change the theme or colors of the tree year after year. It’s definitely too costly to buy all new decorations each year so I make the majority myself. Then I find special ornaments at the store to fill in & give it a finished look. The best part about this is that I always have the kids helping me out. It’s great for having a little craft time with them where we can be creative & talk about anything & everything. So when I decided I wanted to do a neutral look for the tree this year I started brainstorming on how I would create decorations. 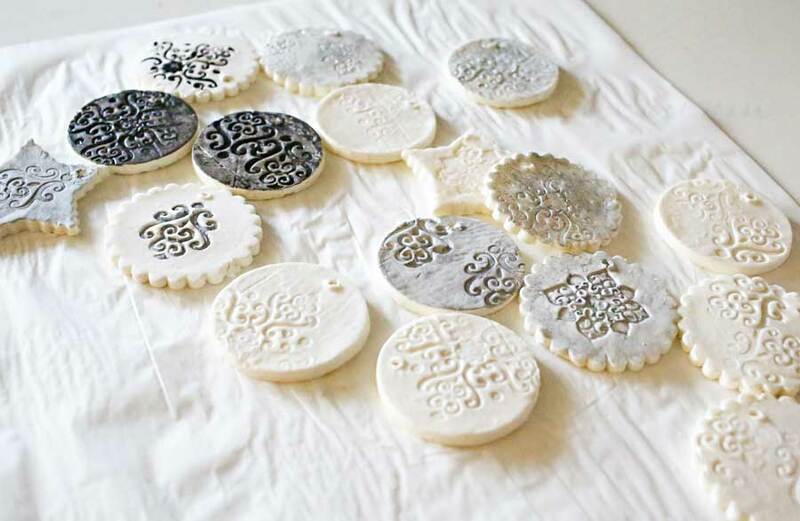 I went through all my supplies & decided that a simple stamped clay would be great. 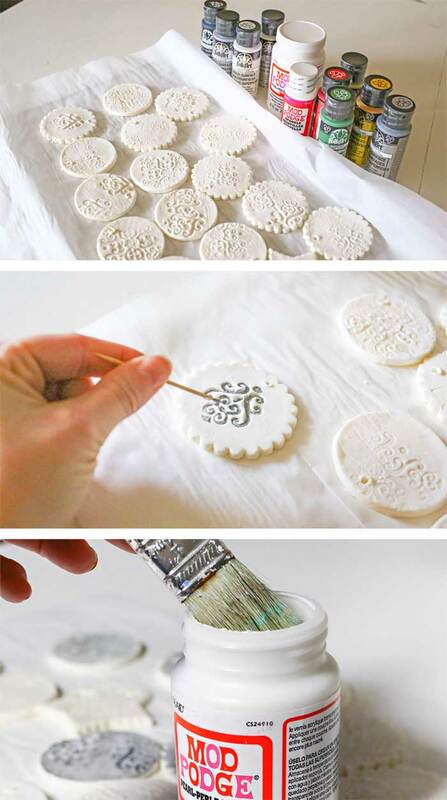 Then I could use Mod Podge Pearl & great Folk Art paints to make them really sparkle. 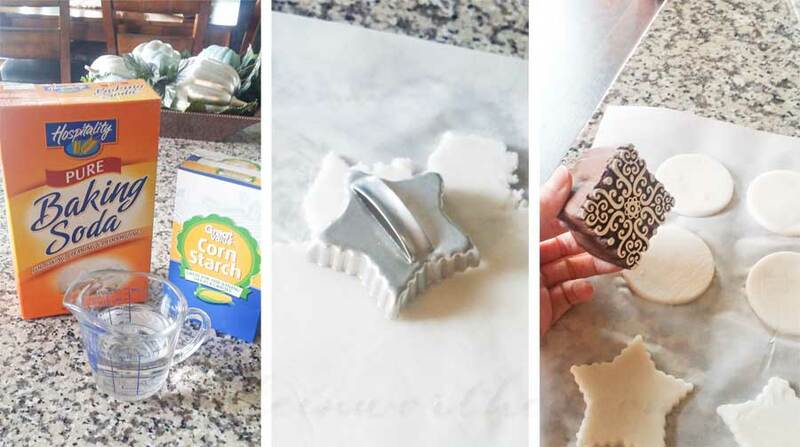 These are all the ingredients you need to make the clay – water, baking soda & corn starch. Cook the mix, roll, cut, stamp & bake. Once baked & cooled you can paint. I used a toothpick to get in those small designs. I used Folk Art multi-surface paint in 2969- White Pearl, 2963- Disco Crystal, 2959- Sequin Silver, 2968- Charcoal Black & 2964- Sterling Silver. All of these have a metallic shimmer to them which was perfect. Then once that paint dried I added a coat of Mod Podge Pearl – a waterbase sealer, glue & finish. 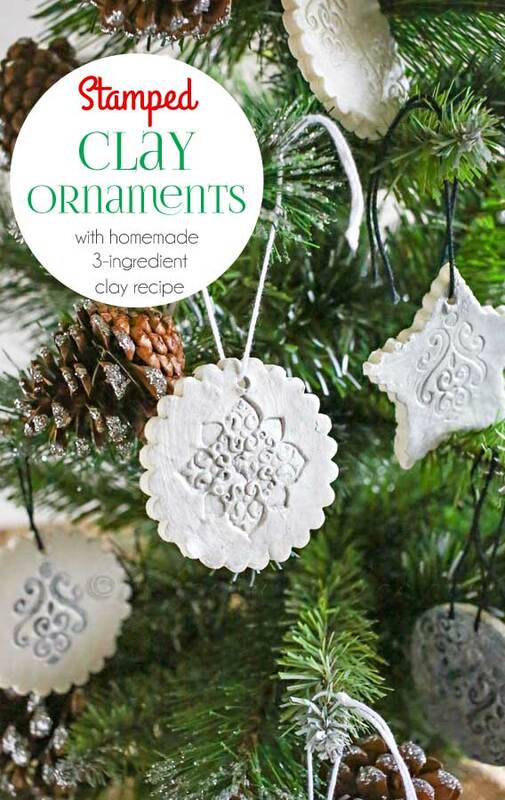 I love it because it not only seals but added a beautiful iridescence to the ornaments. I’m loving my new ornaments. They were so simple & fun to make! 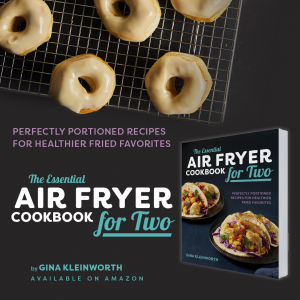 For more info on the products I used here – visit Plaid! 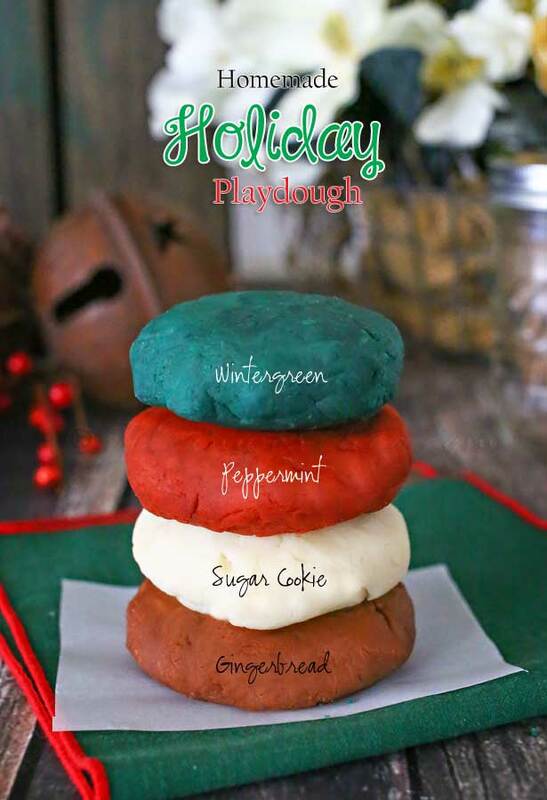 Looking for more holiday projects? 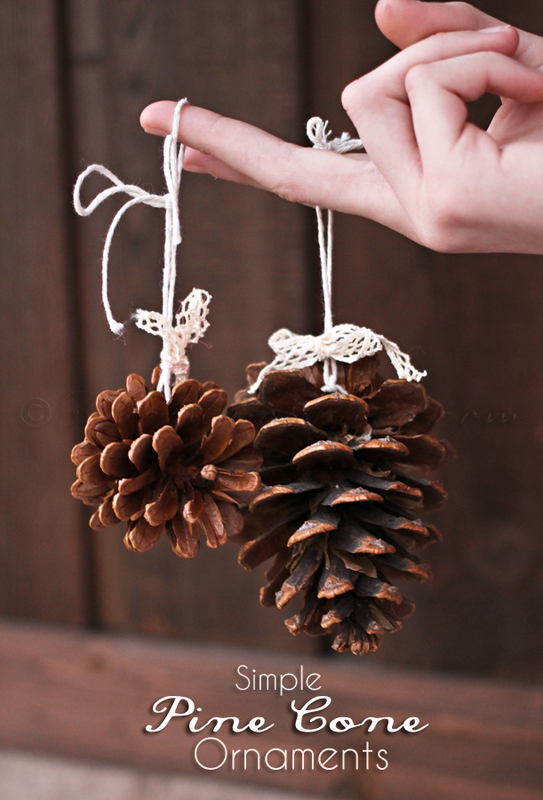 So simple to make and so pretty!